Here is the original dying polar bear photo and post from photographer Paul Nicklen. Read carefully. He – and his associate – never say this polar bear is dying due to climate change but he does link climate change to polar bear habitat and asks readers to join Sea Legacy (of which he is the founder). His co-photographer Cristina Mittermeier acknowledged they had no way to know the cause of this bear’s starvation. At time of this blog post, her photo had received over 1 million likes just on Instagram. Nicklen has nearly 4 million followers of his own on Instagram. The photos – and video – use the method of emotional engagement to capture the viewer’s quick acting System 1 thinking style. There is no question that this polar bear is starving and its life is endangered. Again, per Mittermeier, they acknowledge they had no way of knowing the cause of this bear’s starvation. National Geographic (for whom Nicklen has worked as a photographer), without evidence, links this bear and this photo to climate change. Many media outlets picked up the story – emotional stories engage readers and viewers – and tacked on the claim that the bear was dying due to climate change. The photo and videos were taken in August and published on December 5th, days before a global climate change conference in France. Literally millions, if not tens of millions of people, saw this photo in media reports and shared posts on social media. BBC: Polar bear video: Is it really the face of climate change? Jeff Higdon.Ph.D., Arctic wildlife biologist, noted via Twitter that PB populations around the area where the photo was taken are stable (except some subsets are data deficient/unknown) and starvation could be caused by disease, injury, cancer, etc. Slate: Is that starving polar bear dying of climate change? Probably not. Ultimately we learned that all of us were led, through a likely propaganda campaign, heavily reinforced on social media, to believe something that was not supported by evidence. As the Toronto Sun notes, this photographer used similar photos in the past as PR for his group Sea Legacy. In this case, the photo was released months after it was taken, but days before a 50 nation climate summit in France. Sea Legacy responded to some of the criticisms suggesting that the Inuit want to profit from polar bear hunting. The irony is that Sea Legacy is itself using this as a fundraiser while saying the Inuits’ interest is just money. Sea Legacy encouraged readers to join Sea Legacy and also provides licensing information for use of the video. From a PR standpoint, this was an overwhelmingly success propaganda campaign. This story consumed social media Likes and Shares for days. This campaign successfully delivered the message that polar bears are starving to death because of climate change – and you could make a difference by contributing to the Sea Legacy organization. The photo tugs at our emotions and quickly puts our brain into an emotional response, rather than a rational response. Pre-propaganda campaigns have already established images of polar bears as the sign of climate change; before climate change, we called it “global warming”, hence, a connection to Arctic ice. The photographers added commentary, saying we found a starving bear, experts say climate change will cause melting ice and will lead to food shortages for bears … leaving the conclusion to the viewer –> this bear’s death is due to climate change. Much of the professional media took the bait – and immediately drew that conclusion in their reporting. This method of using a sequence of true statements to direct the target to a false conclusion is common in propaganda. See The most spectacular example of social media propaganda – so far! for another example of this method. The message was distorted at best and possibly wrong at worst as no supporting evidence was provided as to the cause of starvation. Some suggested that Sea Legacy had a duty (because the polar bear is a protected species) to notify the Canadian government who likely would have euthanized the bear and performed a necropsy to learn more. As always, in propaganda messaging, the first message is the one that sticks, even when subsequently shown as false. 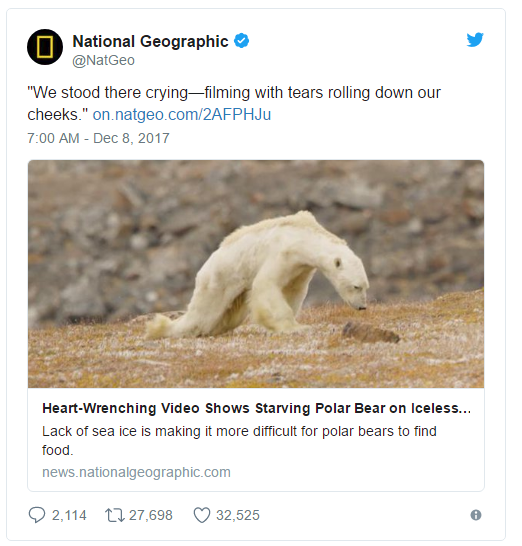 We can be sure that millions of people got the messages: polar bears are already dying due to starvation caused by climate change. Young children in schools are likely brought to tears by these images and this message will stick with them perhaps for life. In the end, this is not a story about polar bears or climate change – but a story about propaganda methods. The evidence that this was a PR stunt is greater than the evidence provided that this bear’s death is due to climate change. This is possibly one of the most successful propaganda messaging campaigns of the modern era. Although as more people learn they were taken for a ride on this PR stunt express, this could cause long term harm to other environmental organizations attempting to legitimately raise awareness of serious issues, as we all tune out “yet another PR stunt”.